The Earth is to make its annual rendezvous with the Perseid meteors this weekend. The meteor shower will peak on Saturday evening and Sunday morning, producing as many as 100 shooting stars an hour. The Perseids are tiny particles, ranging in size from a match-head to a dried pea, shed by the comet Swift-Tuttle. Sky-watchers should look north-east, where the sky will be darkest, to get the best chance of seeing them. Claire Gilby, from the Royal Observatory at Greenwich, London, said that unlike many astronomical objects, meteors are visible to the naked eye and observers need no special equipment to view them. "Weather permitting, the sensitivity and wide field of view of the human eye are perfect for watching the Perseids," she said. "So, to see the Perseids, all you need to do is sit back and watch the night sky." This year there is a chance that the bright Moon will drown out the glow from the fainter Perseids, as has happened in previous years. 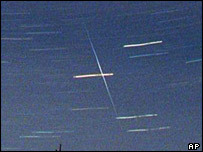 Meteors are streaks of light in the sky caused by blazing pieces of dust drawn into the Earth's atmosphere from near space. The Perseids are caused when the Earth passes through debris shed by Comet 109P/Swift-Tuttle. This comet travels through the inner planets every 130 years, most recently in 1992. The Perseids are so called because tracing their tails back in the night sky mostly leads to the constellation Perseus. This contains a point called the Perseus radiant - the perspective point from which the meteors would appear to come if they could be seen approaching from interplanetary space. The Perseids are sometimes called the Tears of St Lawrence because the Saint's feast day falls on 10 August. The dust itself consists of particles that are travelling at around 50km (31 miles) per second. As they enter the Earth's atmosphere, they burn up with a short-lived burst of light, heat and ionisation.